Joneal Joplin. Dale Hodges. Brian Isaac Phillips. Jennifer Joplin. Oh. You need more of a reason to see this? Why? But OK. Directed by Ed Stern. Written by John Patrick Shanley. The typical Ensemble set-design excellence, only this time from Joseph Tillford. This Irish comedy features what a critic friend of mine thinks might be the best single dramatic scene he’s seen all year. It’s the story of “Tony” (Joneal Joplin), his son, (Phillips), the neighbor widow (Hodges), and her daughter (Jen Joplin). There’s a land dispute. There’s love, mental illness, and some of the best casting of the year. I’d never seen Phillips act; he is vulnerable, honest, and real on stage. His on-stage father (who is the real life father of his co-star) brings such an elegance to the role; his confidence, professionalism, and chemistry with Dale Hodges make the first scene sizzle. Hodges has perfected the crotchety elderly woman so well its easy to forget that she’s actually quite spry. Her physicality and comfort level on stage are inspiring. And then there’s Jen Joplin, who – when cast in the right role – is one of the strongest actresses in the region. This character is Irish farm girl tough. She’s sassy, she’s direct, and she’s been waiting for Phillips’ “Anthony” to fall in love with her. She’s logical, yet you can’t help but empathize with her because she’s so real. Joplin breathes life into her that makes her likable and relatable. It’s so much fun. 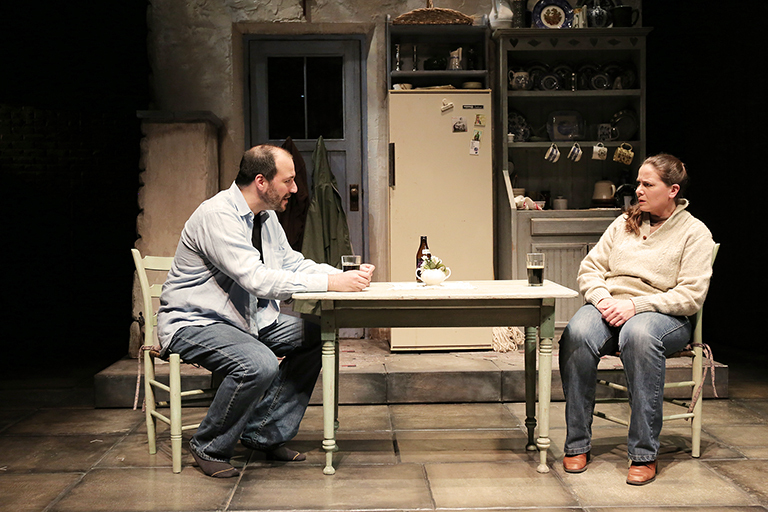 OUTSIDE MULLINGAR is 90 minutes of theatrical excellence and the audience on opening night was engaged with every surprise, every tender moment, and every guffaw-inducing bit of comedy. I highly recommend you see it. OUTSIDE MULLINGAR runs through May 24th at Ensemble Theatre of Cincinnati in Over the Rhine. For more information on this show, tickets, and subscribing to next year’s excellent season, please click here.